Did you get all that? Here’s the recipe (from #sheetpansuppers! ), just in case. Preheat the oven to 325 degrees F., with a rack in the center position. Line a sheet pan with parchment paper. Spread the chocolate chips out in an even layer in the center of the sheet pan. Bake the chocolate chips until they’ve started to melt but still hold their shape, about 5 minutes. Remove the pan from the oven and use a small offset or rubber spatula to spread the melting chocolate evenly around the pan. If you’re using more than one type of chocolate and don’t want them to mix, wipe the spatula between spreadings. Immediately sprinkle the topping(s) evenly over the melted chocolate, gently pressing them down so they’ll adhere. 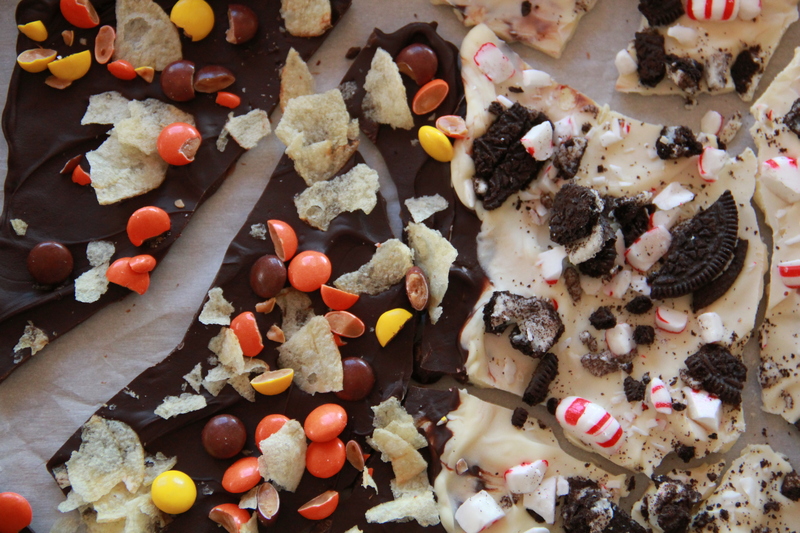 Refrigerate bark, uncovered, until the chocolate is firm and the toppings have set, about 1 hour. Use your hands to gently break the bark into pieces, working quickly so the chocolate doesn’t melt. The bark will keep, in an airtight container in the refrigerator, for up to 5 days with absorbent toppings like chips, cookies, and pretzels; up to 2 weeks with hard candies, nuts and dried fruit. UMmmm. this is the cutest video ever! well done! Well the Mollygram is just the best thing ever! So much fun!!! I’m obsessed with mollygrams! More! more! Ha! Love the video. More please! Those candy barks look soooo delicious! Though there’s one thing I couldn’t figure out – why adding the pretzels?